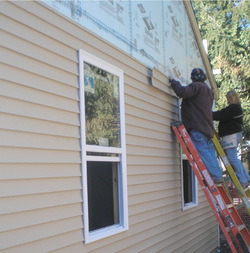 Siding can help shed water, protect your home from the elements, and help to insulate your home! The Contractors and Subcontractors of Rockwall Metal Roofing are eager to help you repair or add siding to your home! With the utmost professionalism, we treat your home like we would our own! We are not completely satisfied until you are! In addition to the manufacturer's warranty, we provide a five year warranty on all of our labor! We want your new or replaced siding to last you a long time! We use only the highest quality materials to insure that your Siding lasts! Not only will your Siding last, but your siding will be the talk of the neighborhood. We pride ourselves in the quality of the work we complete. Rockwall Metal Roofing understands that you are working on a budget, we are too! Call us today to get your NO Obligation, FREE Estimate TODAY! Rockwall Metal Roofing would love to work with you and your Budget to get you the best bang for your buck. With our Highly Competitive Prices, we are sure to put a smile on your face with our Estimates!